Nice, modern, and refreshing "ready to hang art". The canvas is stretched well over the frame. 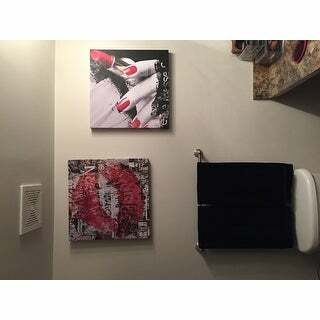 Use it in one of the bathrooms and it looks great. I bought 18x18 since there was no 20x20 size. It would be good if there are more size options. Fashion throughout the ages meets Street Style in Mini Series Urban Fashion by Ready2HangArt. 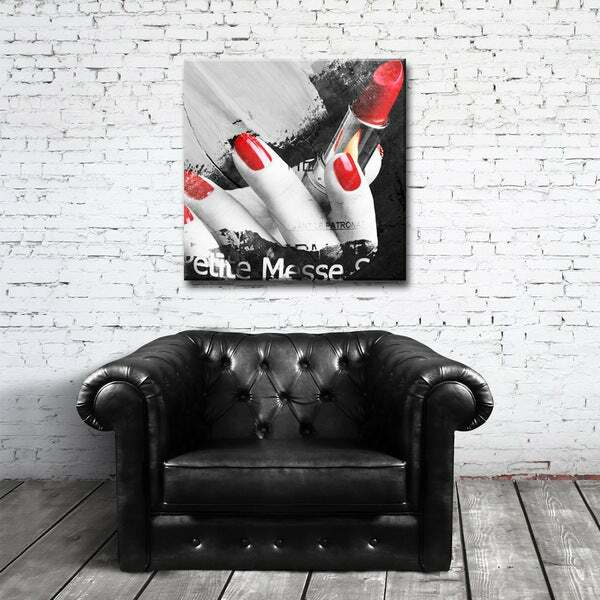 Adorn your walls with these inspired decorative high fashion pieces; bringing a satisfaction of todays fashion desires with an edge to your space Eye catching but surly a statement piece. Fancy me with the ferocious red in Urban Fashion XVIII. Provocative lipstick and sophisticated nails create a quintessential sensation in this oh so hot image. Each canvas is carefully hand crafted with 100-percent Artist Grade Cotton Canvas and enhanced with a UV Protective Gloss Coating for preservation, then completed by wrapping around a wooden frame. Ready2HangArt is a USA based vertical decorative art firm seeking to enhance peoples surroundings with innovative designs, extraordinary quality, and unparalleled value. Proudly R2H makes #decorating simplified. This handsome piece of wall decor will enliven your home. Made in the USA from US and imported parts. bringing a satisfaction of todays fashion desires with an edge to your space Eye catching but surly a statement piece. Fancy me with the ferocious red in Urban Fashion XVIII. Provocative lipstick and sophisticated nails create a quintessential sensation in this oh so hot image. Each canvas is carefully hand crafted with 100-percent Artist Grade Cotton Canvas and enhanced with a UV Protective Gloss Coating for preservation, then completed by wrapping around a wooden frame. Ready2HangArt is a USA based vertical decorative art firm seeking to enhance peoples surroundings with innovative designs, extraordinary quality, and unparalleled value. Proudly R2H makes #decorating simplified. This picture is perfect for my decor. It is a great find. Paired this with another piece by the same artist and it looks great ! Very classy. Perfect for my daughters bathroom.